New out from Charles Jacobs ( about time ) a model with my favourite features, sorry to go on about it, but why isn’t everyone making Hinged lid ovens, it is so much safer than the old “take off” lid when its very very hot . I must say it is a very sturdy looking kitchen appliance, comparing it to some of the latest Chinese imports it is head and shoulders above the average. Results with a thermometer were impressive, our sample was very accurate and it achieved its cooking temperature in record time, this is of course one of the main reasons to buy a Halogen Oven, no need to preheat the oven! Important for the lifetime of your kitchen appliances, how easy is it to obtain spare parts, not a problem with this one, absolutely standard halogen lamp, with push on fittings. The bowl too, is available, if you read the comments on the blog , now and then one gets broken, again not a problem, standard size, is available from several sources. Controls on this model are digital. Nice big wipe clean buttons. Really clear and obvious what to do without needing to read the instruction book. The control panel behaved perfectly, didn’t have any weird symbols or didn’t require the user to clear previous settings. Nice clear LED figures indicating temp /time. Unlike some products on the market, the Charles Jacobs comes with everything you will need: High and Low racks, tongs and extender ring to make the total capacity up from 12 to 17 litres. I was impressed with the racks, having seen some pretty rough examples in recent imports at the cheaper end of the available ovens. 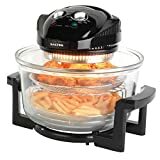 What did buyers of the Charles Jacobs Halogen Oven think…. This is a serious contender for the top spot. It does everything right, good cooking results and a good looking well built product. The price taking all this into account is very competitive . I rate it 9 out of 10. Excellent and Recommended.